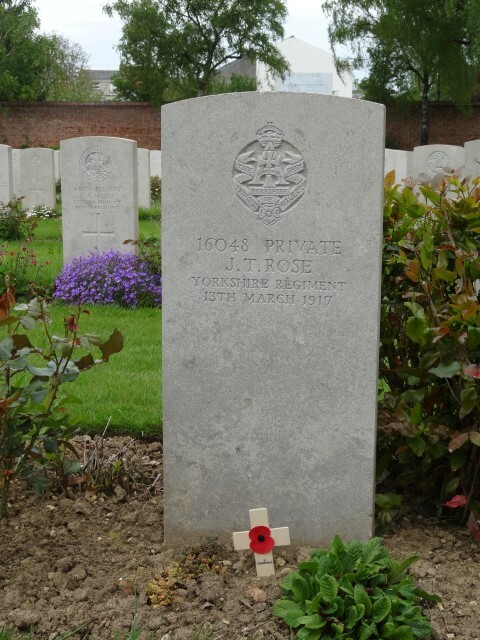 16048 Private John Thomas Rose, 2nd Battalion, the Yorkshire Regiment (Alexandra, Princess of Wales’s Own) was killed in action 13 March 1917 and is buried in Faubourg d’Amiens Cemetery, Arras. He was 22 years old and is commemorated on the Copley War Memorial and the Memorial Plaque in St. John the Evangelist Church, Lynesack. In June 1915, much of the Brigade left Liverpool for Muldros and disembarked in July 1915. The Brigade was part of the invasion force which landed at Suvla Bay on the night of 7 August 1915. Private J.T. Rose entered the Balkans Theatre 28 September 1915. Some 11 officers and 788 other ranks joined the battalion. 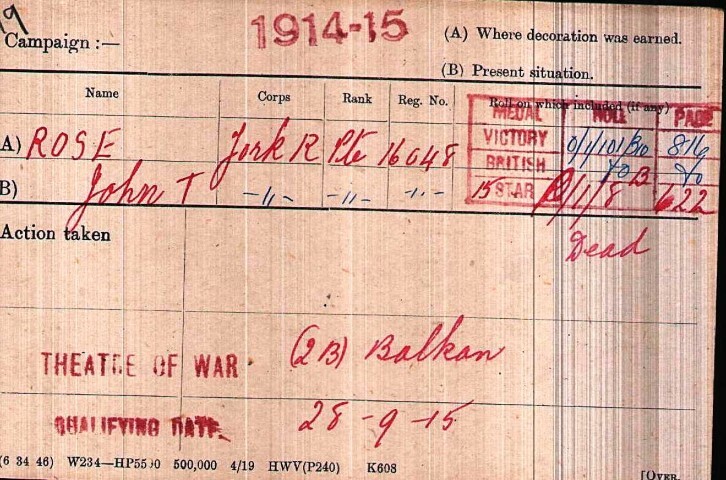 The war diaries for September and October contain little more than “nothing to report”. In November, the authorities decided to withdraw from Gallipoli  and 6/Yorks evacuated Gallipoli 19/20 December 1915 spending some time in Egypt before landing in France, July 1916. The date when Private J.T. Rose joined the 2/Yorks has not been researched. “The villages we passed through on our way had the look of vast lunatic asylums. Whole companies were set to knocking down walls or sitting on rooftops uprooting the tiles. Trees were cut down, windows smashed; wherever you looked, clouds of smoke and dust rose from vast piles of debris. We saw men dashing about wearing suits and dressers left behind by the inhabitants with top hats on their heads. With destructive cunning they found the root-trees of houses, fixed ropes to them and with concerted shouts, pulled till they all come tumbling down. Others were swinging pile-driving hammers and went around smashing everything that got in their way, from the flowerpots on the window sills to whole ornate conservatories. As far back as the Siegfried Line, every village was reduced to rubble, every tree chopped down, every road undermined, every well poisoned, every basement blown up or booby trapped, every rail unscrewed, every telephone wire rolled up, everything burnable burnt; in a word, we were turning the country that our advancing opponents would occupy into a wasteland. As I say, the scenes were reminiscent of a madhouse, and the effect of them was similar: half funny, half repellent. They were also, we could see right away, bad for the men’s morale and honour. Here, for the first time, I witnessed wanton destruction that I was later in life to see to excess; this is something that is unhealthily bound up with the economic thinking of our age, but it does more harm than good to the destroyer, and dishonours the soldier. Among the surprises we’d prepared for our successors were some truly malicious inventions. Very fine wires, almost invisible, were stretched across the entrances of buildings and shelters, which set off explosive charges at the faintest touch. In some places, narrow ditches were dug across roads, and shells hidden in them. A nail had been driven into the plank, only just above the shell-fuse. The space was measured so that marching troops could pass over the spot safely, but the moment the first lorry or field gun rumbled up, the board would give, and the nail would touch off the shell. Or there were spiteful time bombs that were buried in basements of undamaged buildings. They consisted of two sections, with a metal partition going down the middle. In one part was explosive, in the other acid. After these devil’s eggs had been primed and hidden, the acid slowly, over weeks, eroded the metal partition, and the set off the bomb. “By the beginning of the year 1917 the British front had been increased to 120 miles, held in the north to south or left to right in the following order of armies; the Second about Ypres, the First in the Armentieres district, the Third thence to the south of Arras then came the Fifth, while the Fourth joined onto the French. The 2nd Battalion, the Green Howards spent the early part of January about Bailleulval and Le Souich refitting, training the drafts which here joined and cutting wood in the forest of Lucheus, this work all greatly interfered with heavy falls of snow. Then about the 26th the Battalion moved to Mondicourt and was employed on a new railway there under construction but after some 10 days of this work the Battalion marched via Humber court and Beaumetz to Achicourt where it moved up into the line relieving a battalion of the 14th Division; here A Company was in the front line, B Company at Agny and the remainder of the Battalion in reserve at Achincourt. When relieved the Green Howards were in divisional reserve at Beaumetz, furnishing many working parties, particularly on the construction of a Corps cable trench in Beaumetz and Berneville. Then at the end of the month the Battalion moved to Arras where it was for some days employed under the R.E. Private J.T. 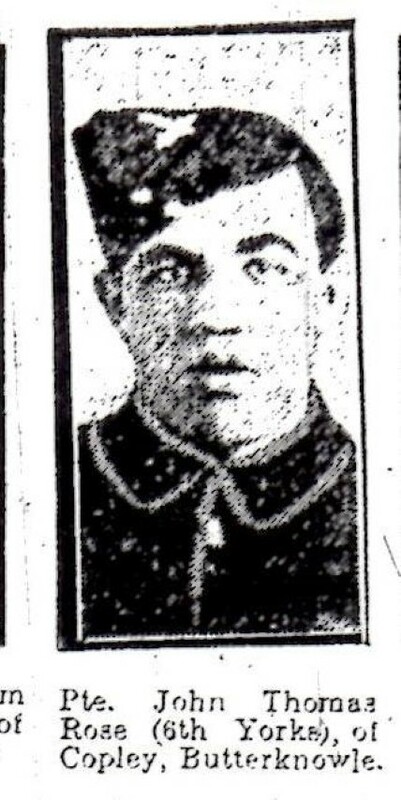 Rose was the only soldier serving with 2/Yorks to be killed in action 13 March 1917 which was one day prior to the pursuit of the German Army to the Hindenburg Line.